College: Turner played four years of beach volleyball at Grand Canyon University. As a junior she compiled a 22-3 match record and was named AVCA Beach Volleyball All-American, then as a senior was chosen as AVCA Beach Volleyball Honorable Mention All-American. 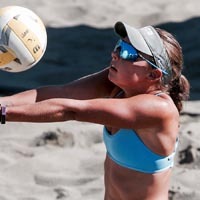 Personal: After being cut from her high school indoor team, Turner switched to the sand, where she was a U-18 National Beach Volleyball Champion.